Eric Pickles last night accused the European Union of trying to ‘wipe England off the map’ by developing a new cross-Channel region, complete with its own ‘flag’. The Cabinet Minister condemned the EU for ploughing millions of pounds of taxpayers’ money into the ‘Arc Manche’, the name given by Brussels to an ambitious attempt to merge Northern France and Southern England. Mr Pickles, the Local Government Secretary, says he is incensed to have discovered that Eurocrats are planning to roll out a new Arc Manche ‘transnational emblem’ across England. The logo is described by its designers as a ‘series of concentric circles symbolising the flow of projects . . . and bridges between territories’. * A £7.6million network of ‘cross-Channel’ cycle lanes. * A £5.5million scheme to pay for circus clowns to perform throughout the Arc Manche region. * A £2million programme of cross-Channel ‘contemporary art’ tours. Mr Pickles said he had inherited the plans from the Labour Government. An EU diktat governs the use of the logo, including a warning to the recipients of Arc Manche money that their ‘grant may be reduced if the project does not respect the obligations in terms of publicity’. Is the LibLabCon trying to collapse Britain from within? What do you think a 'United States of Europe' would look like? Should we be investing in magnetic-levitation trains? Yes, the EU is also banning Worcestershire sauce and replacing it with frog juice. Terrible, terrible. "‘Cross-Channel’ cycle lanes" WTF? 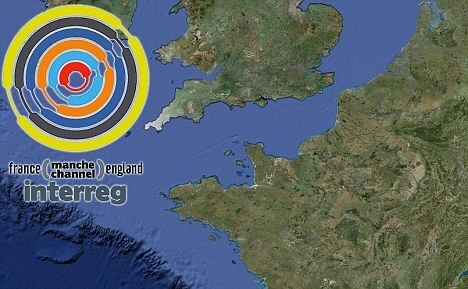 who would want to cycle from Plymouth to Roscoff... that would take forever or did they mean the closer Dover to Calais? Just found the website... it isn't new this has been going on since 2001 (when they started getting it together) and finished in 2007... hardly new is it? Because the Daily Mail is known for its unbiased, high-standard journalism that never sensationalises claims about the EU with wild, paranoid accusations of a secret conspiracy against the UK. That's right, Anglocentrics! Everything is about BRITAIN! The EU is doing something? Clearly destroying Britain is an ulterior motive. We lost Eurovision? Those darn Europeans showing their hate of us again! Dear Lord, a lot of paranoid rubbish. It's essentially a convention of local councillors who share views on governance on either side of the English Channel and discuss maritime issues relating to use of the Channel. I'm sure their geographical position gives them a lot of shared experiences to draw on. No it's not, IT'S A CONSPIRACY TO DESTROY THE ENGLISH PEOPLE! IT'S GENOCIDE EUSSR!!! A question for Pro EU People?